FOLLY: It's purely coincidental that the bar review and our food review came out in the same week, but it's a new spot and everything wants to know if it's worth the hype. Our bill at Noir was the most amount of money that Nosa and I have spent on a single meal together. You can do the math by adding up the damage section. We actually decided to throw out a budget after looking through the menu because we didn't think we could really review NOIR by trying one or two dishes, and so we decided to go all in. NOSA: There's Tarragon and NOK, maybe Sky Lounge to some degree, but I think NOIR is Lagos' first real brush with "Fine Dining". I might be wrong and I'm open to a debate in the comments. FOLLY: All together, we ordered 6 different things if you include dessert. 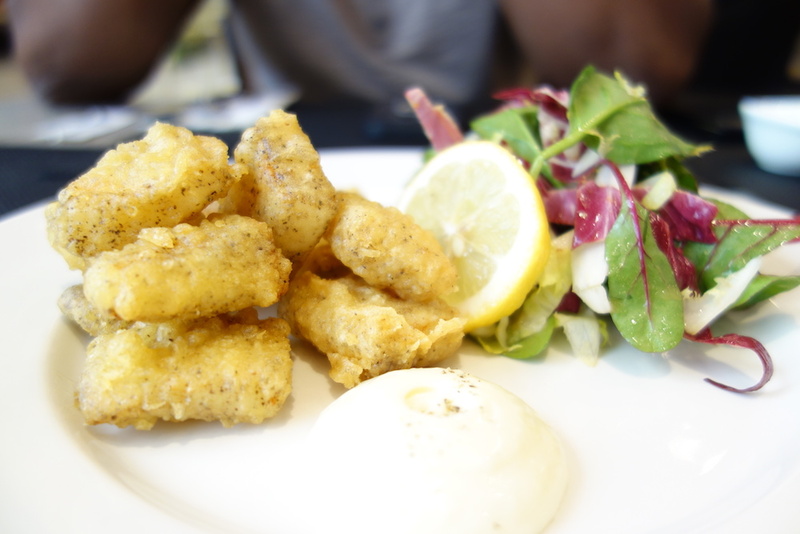 We started with Fried Calamari in Batter and NOIR Rillettes. Whenever we go to a new spot, more often than not, we order the fried calamari. It has little significance but it's become a thing we do. NOSA: TL;DR Calamari is delicious. FOLLY: As a result, we've had some really interesting calamari experiences: too long, too tough, or too oily. The most interesting has been chin chin calamari at RSVP and the worst was the "stewed" calamari at Bangkok. NOSA: Unlike Bangkok, NOIR's calamari didn't disappoint. They didn't overdo it with the batter and the calamari-ness of the calamari wasn't overwhelming. If you didn't know, the latter is a real thing that happens. Experienced it Zanzibar. 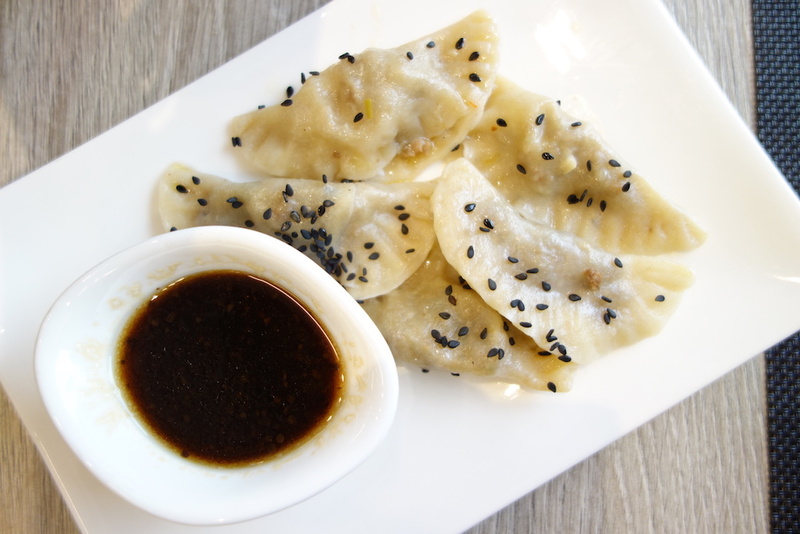 The NOIR rillettes is NOIR's take on pork dumplings. The plating felt a bit lazy and uninspired. 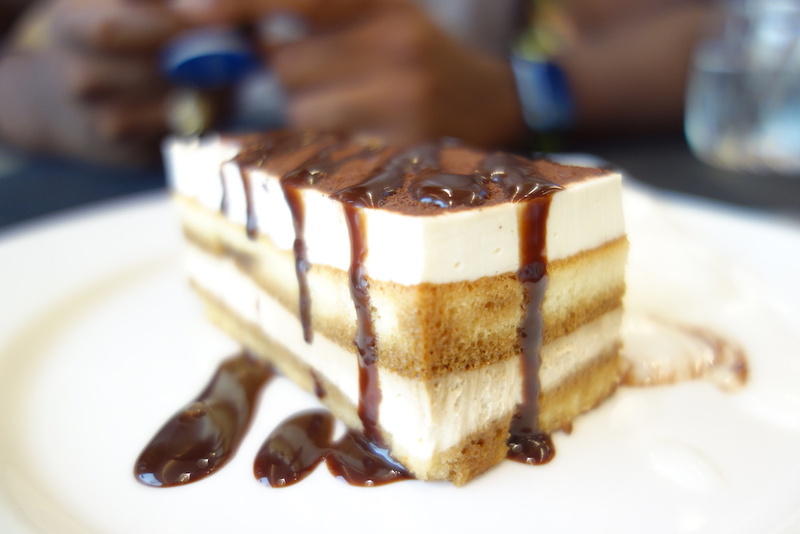 And at N3500, it didn't give me what I expected. It was good, but it still disappointed me a bit. FOLLY: They were much smaller than we expected and the dough overwhelmed the rillette. The sauce was a professional's take on wasabi and soy sauce - LOL. As my friend remarked, the wasabi hits you on the nose but it finishes sweet. NOSA: Per the description on the menu, it's just ginger and soy, but yeah, it doesn't taste like it. NOSA: We went all out a bit with the mains: Spinach & Ricotta Ravioli, Seared Salmon Fillet, and 250g Beef Strip Loin. FOLLY: The ravioli was my favorite item that we tried at NOIR. The roasted red pepper and tomato sauce (I think) that it was served with was also perfect. NOSA: It was a tomato sauce and yes, it was perfect. I think I dunked my fries in it at some point. No shame in game. The ravioli, too, was so goddamn delicious. FOLLY: And my least favorite? The salmon. I couldn't stand the "creamy pea soup" thing that it was plated in and the salmon itself was just the slightest bit tasteless. The cripsy skin was fantastic though. 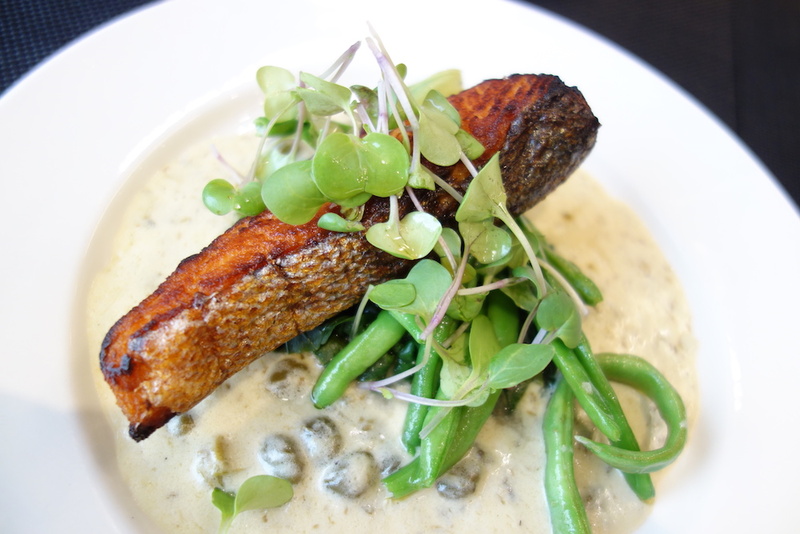 NOSA: Folly is razz because I liked the Salmon and the "creamy pea soup" wasn't bad. NOSA: The most interesting part of our lunch was definitely the steak. FOLLY: It was a bit of a chore to be tasked with making one's steak. NOSA: Apparently, it's actually a "thing"
NOSA: The whole DIY thing has that Korean BBQ vibe. They dump a bunch of meat on your table and tell you to figure yourself out. FOLLY: After I enjoyed the finished product I truly did not mind because I could make it more to my satisfaction than they might have in the kitchen. No matter how much you emphasize when you order it, in our experience in Lagos, your steak comes out more cooked than you requested, so being able to control that cooking process was great in that regard. 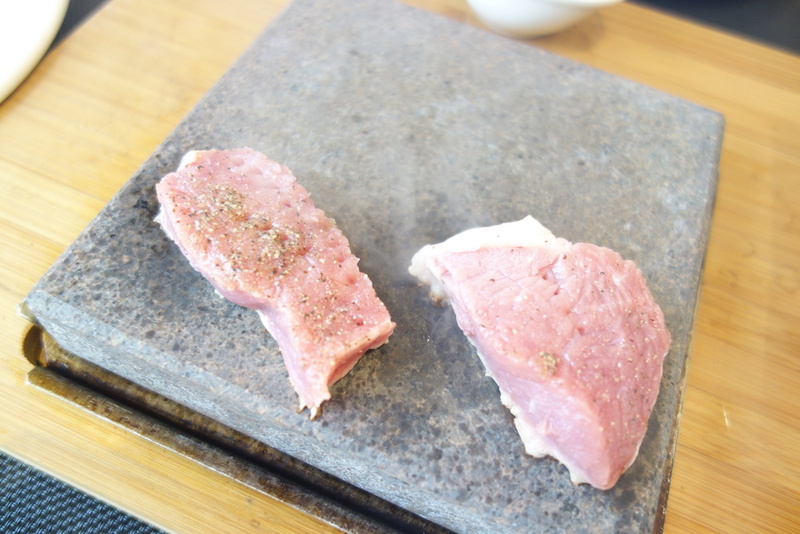 NOSA: I think that's the very idea behind steak stones too. I was doing some googling and found the science behind it. It kinda validates the idea and what not. Also, after our little experience at La Boucherie a couple years ago, it's certainly a valid solution. The principle of steak stones is a very simple one. As a result it is still used today and despite huge advancement in cooking technology and equipment over the last 50 to 100 years, nothing has been able to come close. The undeveloped cooking skill is used by remote tribes around the world, as well as in the most trendy restaurants and cooking establishments. Unlike more advanced cooking methods, steak stones will not burn food and will ensure that food is cooked evenly throughout, reducing the risk of food poisoning caused by undercooked parts of food. As well as all of this, cooking with steak stones requires absolutely no fat or oil, which makes it a far more healthier alternative than practically every other cooking method available. FOLLY: I even think we made the best steak we've had in Lagos, shame if you're reading this that you'd never get to taste it. My only regret is that our original selection (rib eye) was not available so we ordered the sirloin begrudgingly. FOLLY: NOIR was a great experience for me. The price point is definitely too steep for me for every day dining so I will be forced to save NOIR for very special occasions. NOSA: Like every "fine dining" thing anywhere, it's more about the experience than the food. Don't come here expecting to eat till you're full. Just go down the road to Brown's Cafe for that. About 10 spots all together, might be a struggle when the restaurant is busy.